Objective: Play for the highest possible score using the difficulty settings defined in the challenge. Post a photo or video of your score in this thread. Scores must be achieved between March 15th through March 31st, 2019. Screen captures are not allowed as they are easily manipulated for falsified scores. Multiple submissions are permitted. The player with the highest score at the end of the competition is the victor! Difficulty Level: Offroad. Press the F1 Key to select the Offroad course. Message: Welcome to our 54th Squad Challenge! This time we're playing our first ATARI ST Squad Challenge! Buggy Boy is a fun Racing game with additional objectives to complete in the course. 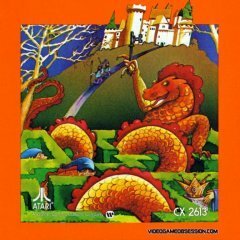 Buggy Boy was nominated in our recent topic asking Atari I/O Members what games they would like to see in an upcoming Squad Challenge. Buggy Boy was suggested for the Atari ST as a fun game that will be easy to learn and difficult to master. A very special WELCOME to all ATARI ST players joining us for this Squad Challenge! I hope you have a lot of fun with this challenge and get in some good scores! P Buggy Boy ROM and Instructions attached below. Good luck! This is our first Atari ST Squad Challenge. gamers to participate in this challenge! If I recall this never had a cart? Only disk? STs never had much of anything on cart. A few things but mostly accessory stuff. That's a good thing, too. Yes they have cartridge ports but I believe it was a wasted port as no one seemed to use it. Makes sense because disks were cheaper than carts but they were also very easy to pirate. I honestly didn't know that was a cartridge port. I thought it was some kind of I/O interface port. I'm going to join in about a week...once my house if back in order. The only true cart device I know of was for some sort of MIDI use. But anything cartridge for the ST is very rare. There's no where really to turn on developing homebrewed games on cartridge because the boards are almost non-existent. This is the only information I could find on it. Made all 5 Legs. Learned a few new tricks during this run. One of my favorite ST games. I just wish ST games were more abundant in the wild. ST games are more scarce than anything predating it. 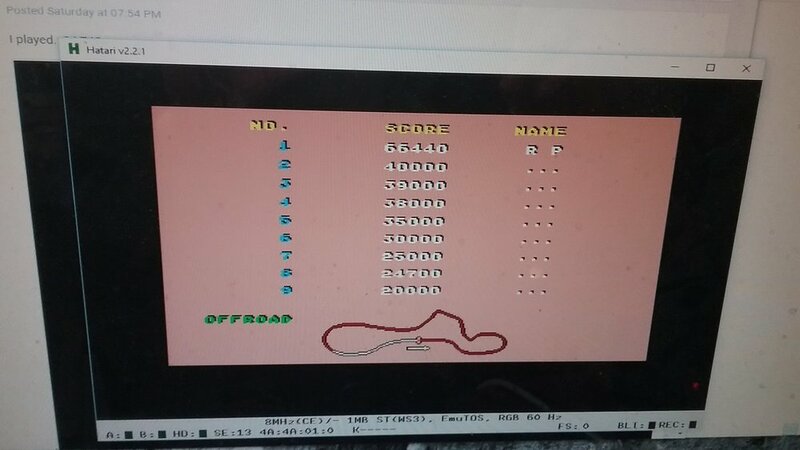 Got it running on an emulator (Hatari). There were one or two small annoyances. I can give the details of how I did it in a little while, in case anyone has trouble. My score was 66,440. Neat game! When you open Hatari, it will run without a floppy disk image present. 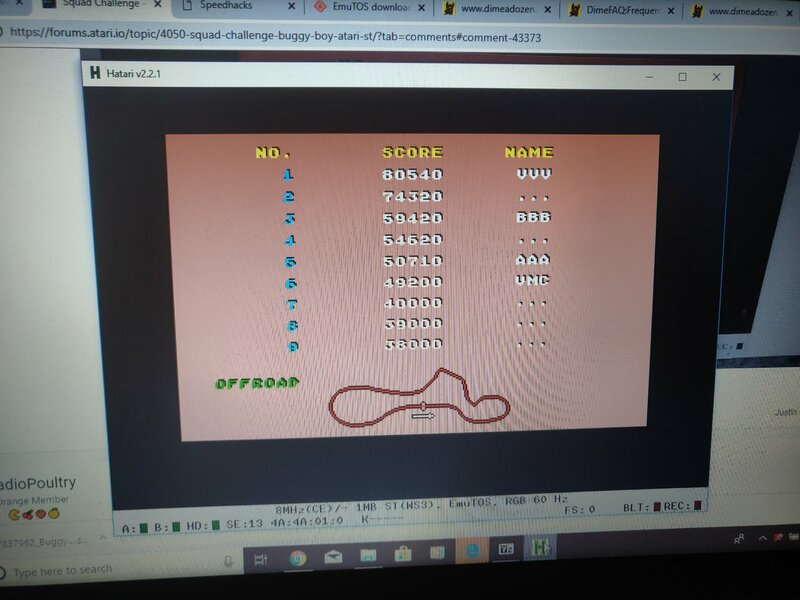 Press F12 to open the Hatari main menu and click "floppy disks". 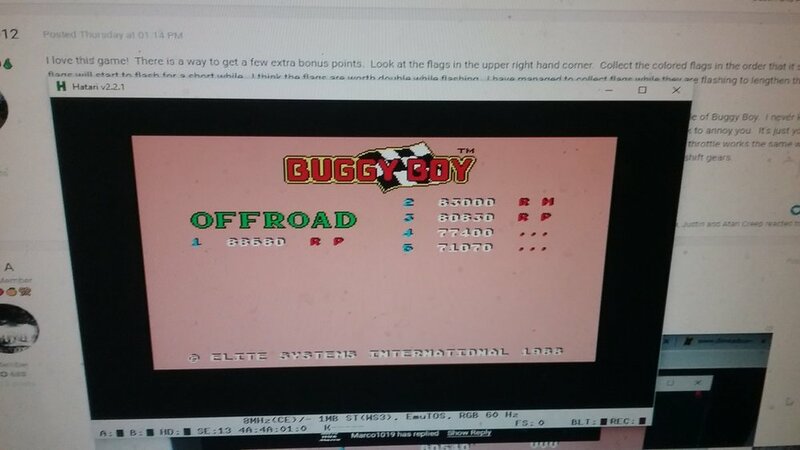 To the right of Drive A, click "browse" and find the Buggy Boy disk image file. Go back to the main menu, select "reset machine", and click OK. The emulated ST will reset and after a few seconds Buggy Boy will finish loading up. Hatari disables joysticks by default, but you can enable them in the main menu (F12) under "Joysticks". For Buggy Boy, you'll want to select Jostick 0, so click the left arrow and switch "disabled" to either "use keyboard" or "use joystick". I'm using keyboard, myself. The default key assignments are the arrow keys for directions and right ctrl for fire, but you can redefine them if you want. Keep in mind you will lose all these settings when you close Hatari unless you save the configuration from the main menu. I love this game! There is a way to get a few extra bonus points. Look at the flags in the upper right hand corner. Collect the colored flags in the order that it shows and the flags will start to flash for a short while. I think the flags are worth double while flashing. I have managed to collect flags while they are flashing to lengthen the time the flags flash. 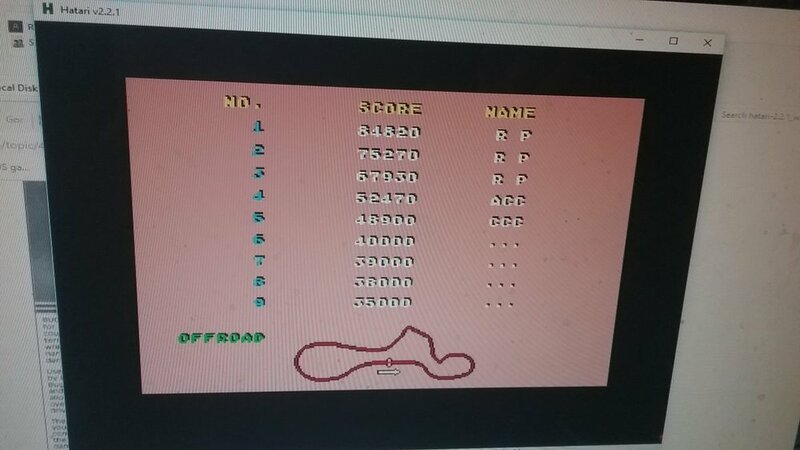 I remember playing this game at an arcade/go kart place my hometown use to have decades ago. It was the only time I seen the arcade of Buggy Boy. I never knew any form of home computer or console got this game until recently. Unlike the arcade version, however, the ST version lacks other cars on the track to annoy you. It's just you and the open road. Controls are simple making this an easy game to pick up and play. And you don't have to hold throttle down the entire time. The throttle works the same way as 2600's Enduro. Get it up to speed and let off. It will maintain speed until you either hit something, slow down, or crash. Fire button is used to shift gears. Awesome score, RP! I'll have to give it another go. Never played this before. Or any other ST game at all. Pretty fun! And thanks to @RadioPoultry. I would have never been able to figure out how to get that emulator working with your how-to! Improved my score a little more! 88,680. I discovered a trick: if you gather flags while they are flashing, they add up to your next sequence of flags no matter what color they are. I've added up four flags in a row this way before the flashing ended. In theory, you could really add up points this way. So that's how that works. 48550 and a few pictures of my setup. I'm loving that setup @RickR! That's my ST dream setup! Thank you! I love the Gotek drive. I have one in my Amiga too. Let me know if you need help upgrading at some point. Those are the exact models I have too! It's too bad they didn't have the foresight to call it the 520 STFU. That would have been a mic drop. The secret of the Gotek drive is to buy one that's been pre-flashed for use on Atari or Amiga. Because flashing them yourself is a total PITA. If you get one pre-flashed, it's a pretty simple matter of taking some screws out, disconnecting two cables and re-assembling. Very easy. Although in the Amiga, you probably want to replace the leaky battery while you are in there. I guess I'm the weird one. Those are cool devices but as hard and expensive the STs are I don't think I would have the heart to modify one. I don't mind using floppies. Besides, if I get games on disk for one and have a modified flash drive installed I wouldn't be able to use the disk the game came with Awesome setups guys! I totally understand your point of view. But I can tell you, the Gotek upgrade is totally and easily reversible. You can put it back the way it was in 15 minutes with just a screwdriver. In my case, my floppy drive no longer worked. I've kept the broken drive so I can put it back if I ever need to (and I figure out how to fix it). It's also possible to use an old PC floppy drive instead, but they usually don't fit exactly right. It is possible to use a PC drive but there is an issue...Atari ST Floppy drives are set to work as Drive 0 and PC drives are set to work as Drive 1. That's why PC floppy cables have that twist in them to match the drive. Not sure if that is the only difference but I do know that the drive itself has a setting. Not exactly sure if it is a jumper setting or a some other type of connection.